I Love You Supes but Tonight – I’m Bat Girl! A little while ago, I was sitting here minding my own business and a bat whiped by my head. I woke up my husband only because I wasn’t sure if it was a bat, a big bug or a bird and I knew I’d need someone to man the door. 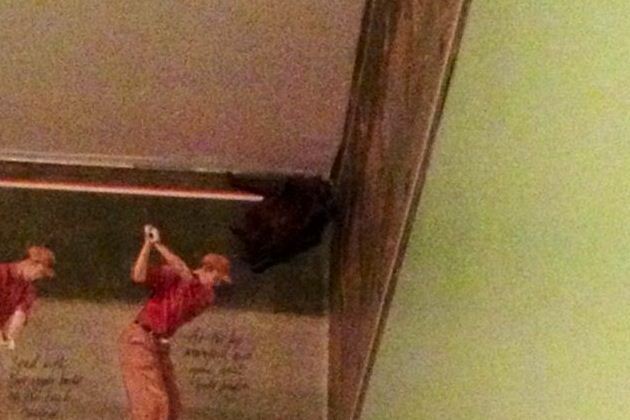 We searched the first floor and he found the bat perched up in the corner of the man cave ceiling. I opened the back door and tried nudging it with a broom which sent it on a circular flight, terrorizing my husband who decided it was time to wake up our 17 year old son for more back up – to protect me. The bat circled several times but I couldn’t coax him out the back door. Instead, he perched himself atop one of the curtains. Again, I nudged and he again, took flight, circling my head which sent my husband and my son running for cover. I’ll admit I ducked a few times and probably even rope-a-doped. My husband suggested I get the pool net to catch him in, so I ran outside in the dark to the pool, got the net, removed it from the six foot pole, ran back in and began trying to net this poor frightened creature. Unfortunately, instead of being caught in the net or flying out the open back door, it headed straight for them and they valiantly scattered again and no one saw where he landed. For the next 20 minutes, we all searched, hoping he hadn’t found his way upstairs. Fortunately, I grabbed my iphone with the flashlight and located him behind a window curtain. As they stood about 15 feet away, I again tried to net this poor thing but he fell behind the radiator and crawled between the slats. I used a two foot plastic Christmas cane to nudge him out and he scampered, squealing his head off onto the living room floor and then again, took flight. This time, I took chase with my oven mitts on, pool net in hand and like Chrissy Everett, my old tennis days came back and after knocking over my 240lb 6ft tall son, who went rolling onto the floor, I caught the bat in the net! “OPEN THE DAMN DOOR!” I yelled to my husband while my poor son climbed to his feet in his BVD’s and I ran for it, out onto the front porch, shook the net and watched him flap off into the night. This entry was posted in humor, life, Personal and tagged Bat, Batgirl, Batman, Bats, family, hero, humor, Superman by P.S. Bartlett. Bookmark the permalink.